Thomas Armstrong III was born in Silver Creek, MS, in 1941. He joined the movement as a sophomore at Tougaloo College in Jackson, working on voter registration and other projects. After the Freedom Rides he continued to work around the state on voter registration and also participated in efforts to integrate Sunday services at white churches. In 1964 he attempted to integrate Millsaps, a private Methodist college in Jackson, but the class he registered for was canceled. He moved to Chicago and in 1966 began working as a contract specialist with the U.S. Postal Service, managing trucking services. Now retired, he lives in Naperville, IL. I arrived at my assigned polling station at 5 AM on November 4. My group of ten election judges opened the polls for voting promptly at 6 AM. As the first vote was caste I wanted to laugh, I wanted to cry. I sat in awe. This is it. We are on our way. As voters poured in they wore tremendous smiles. It was like they were projecting an unwritten message: “Yes we can.” Seventy-eight percent of the registered voters in the precinct where I worked did vote. Breaking speeding records while delivering the votes to the Dupage County Illinois Board of Elections I could hardly wait. Precious items were locked in the trunk of my car — election ballots. Jesus poured out his spirit on that Tuesday. Through that spirit, I could see the many prophets with smiles on their faces: Medgar Evers, James Chaney, Michael Schwerner, Andy Goodman, Barbara Jordan, Nat Turner, Fannie Lou Hamer, Malcolm X, Harriet Tubman, Martin Luther King, Shirley Chisholm, James Farmer and others. It was a historic day in America. My heart goes out to the prophets of my life: my departed parents, and all my family members and friends. I so much wish to share with my close civil-rights movement friends, those who walked with me through the fires of hatred and the shadows of death — Dorie Ladner Churnet, Joan Trumpauer Mulholland, MacAuthur Cotton, Betty Poole Marsh, Mary Harrison Lee, Hollis Watkins, Jimmie Travis, Edwin King and others — the precious projections of love, hope and peace. More than ever we are bound together as never before. We must make that bond work for this nation and the world. Barack Obama has made history. He stands on the shoulders of many others. We now must again stand with him. We must support his Presidency because his Presidency belongs to us, we the people. America will come together as one nation, under God. There is an old saying, author unknown: “Life isn’t about waiting for the storm to pass, it’s about learning how to dance in the rain.” During the 1960s we didn’t wait for the storms of segregation to pass and we performed our dance well. Thomas, Thank you for the price you paid to confront the ugly lie of racism, and open the door to democracy for black people. Thank you for sharing this story. It is especially poignant in the wake of the election of Barack Obama because he could not have won it were it not for the efforts of you and others. 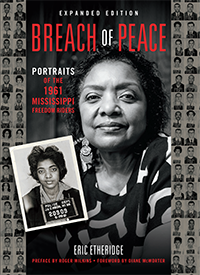 By the way, I wonder if you know of a woman who was in the MS civil rights movement by the name of Anne Moody? She wrote a meticulous and moving autobiography called Coming of Age in Mississippi that captures the soul of growing up poor and black in the rural South. She too joined the movement in college at Natchez College. It was published in 1968 by Laurel, of Dell Publishing. I share your sentiments about Obama’s election. You, understandably, played a key role in shaping this moment in history. Our early childhood experiences Mississippi has served to shape our appreciation for this historic moment. I could not have imagined ever having the opportunity to vote for a Black man for our president. Stay well. I share you sentiments regarding this historic moment in history. Our childhood experiences in Silver Creek has served well to shape our impressions about the significance of this event. I could not have imagined, in wildest dreams that I could ever have had an opportunity to vote for a Black American for president. We must stay vigilent as our work has just begun. I’m a Tougaloo alum and I currently serve the College as Community Outreach coordinator. I’m proud of the legacy that Tougaloo has and continues to build.